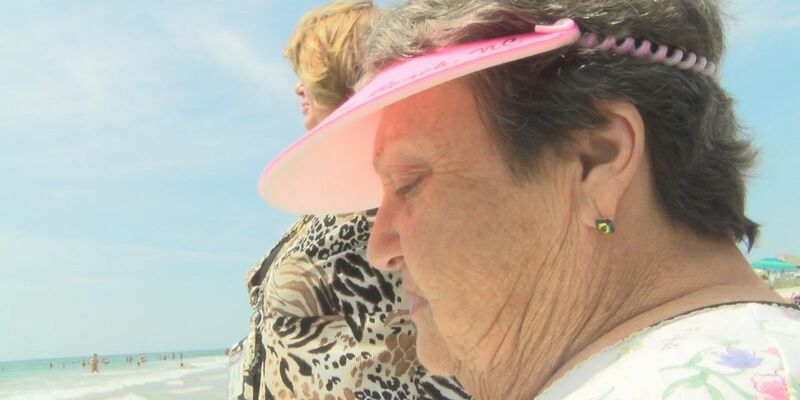 WRIGHTSVILLE BEACH, NC (WECT) - The beach, the ocean and the sand are a new view for 78-year-old Margaret Browning. Browning lives in Newton Grove at Rolling Ridge Assisted Living, but Tuesday, she traveled with staff and her friends for a day trip to the beach and lunch at Johnnie Mercer's Pier. When she first got off the van, Browning had no idea what do expect. "I've never been here before," she said. All she wanted to do was put her feet in the water. Thanks to a beach access wheelchair from the Town of Wrightsville Beach, she was able to make it onto the sand and see the waves for the first time. That is the same phrase she used several times to describe the sights and sounds, and she thoroughly enjoyed feeling the water hit her feet. "We see a lot of their joys and we see some of their sadness too," explained Malinda Cotton-Knight with Rolling Ridge. "But it's wonderful that we were able to bring a group of seniors to the beach today, because probably most of them wouldn't have another chance to go again in this lifetime." For Activity Director Linda Sealey, Browning's trip to the beach was another reminder of what makes her days at Rolling Ridge worth it. "I felt like crying actually, it was so beautiful," Sealey said. It is a day, Browning will hold on to, a big experience, that left her with an even bigger smile on her face.